Recent developments in information and communication technologies (ICTs), in the context of the needs of groups of knowledge workers such as lawyers who use ICTs to form knowledge networks, have created new management dilemmas.1 Not only have many law firms embraced the use of ICTs in their legal practices, but many clients of law firms, especially large corporate clients, now increasingly demand sophisticated online legal service delivery platforms.2 In this changing and challenging business environment information and knowledge management (IKM) is becoming critical to law firm success.3 At its core the practice of law is about the provision of specialised services which are based on legal knowledge. This knowledge is grounded in authentic primary and secondary legal information sources. The accessibility and researchability of many of these sources as well as other information sources have multiplied exponentially through the use of ICTs, a fact which stresses the need for managing law firm information and knowledge. This article reviews the importance of managing the information and knowledge assets of law firms and presents the findings of a survey4 of IKM practices at South African law firms. Firstly, an overview of the findings of a literature study is presented. These findings will demonstrate the role of IKM in the changing legal information environment and shed some light on international and national law firms' information management-related challenges and benefits. Secondly, an analysis of the empirical findings on South African law firms' use of ICTs for knowledge management purposes is presented. The aim of this article is to provide insights into law firm knowledge management and its effect on providing legal services to clients, bearing in mind the burden of the billable hour. In business, as in the case of legal service delivery, the focus nowadays is more on intangible assets such as intellectual capital, knowledge-enriched client relationships, and the competence of lawyers. Lawyers can be described as "knowledge workers", that is, legal experts who perform knowledge-based legal services in the knowledge economy (KE). Brinkley9 lists various KE definitions, summarised here as an economic state where success is based mainly on the effective use of intangible assets, for example, tacit knowledge, experience, skills, and the innovative potential embedded in humans as the carriers of expertise, which is then used as the key resource for competitiveness. Within the context of this emerging10 economic structure and given the legal practice culture of the billable hour, the rationale for this study is to determine how and why law firms, specifically South African law firms, apply IKM technologies to assist and support lawyers in delivering legal services, billed by the hour, to their clients' satisfaction. Information and knowledge management (IKM) in law firms is directed at providing the firm's lawyers and staff with cost-effective tools to support the daily processes through which an understanding of "the law", "the world" and "the client" is created and shared.11 It is important to note that not all IKM practices are technology-based. For example, informal conversation during a coffee break at work may develop into a practice-related, problem-solving, knowledge-sharing event. However, modern law firm IKM initiatives generally involve some form of ICT application to facilitate knowledge sharing, especially in global legal practice. In this study the focus is only on technology-based IKM, excluding knowledge-sharing practices that do not involve ICTs. Within this delimitation of the study, IKM tools and technologies will typically include corporate intranets, portals, law firm web sites, electronic document and web content management systems, electronic mail indexing, data mining and federated searching of digital information sources. Law firms also apply financial management systems for the purpose of time billing and accounting, and information on clients and matters are kept in case management systems. These systems are often integrated with other management information systems and business intelligence systems all of which form part of the larger IKM environment aimed at managing the business of legal practice and sharing the knowledge of lawyers and law firm staff to their business's advantage. KM has major implications in the learning capability of an organisation and its ability to adapt to an ever changing and competitive business environment. A further goal is improved integration between member firms, the group service directory, and group knowledge management. Effective knowledge management remains an important part of managing the wealth of experience and resources available within the group to the benefit of all. Continuing group projects to enhance training, research and information management is underway and scheduled for finalisation in 2010. [C]hange-ability is the basis of sustainable high performance which involves: Getting the right people focused on the right things and engaged in the collective effort; the right kinds of management and leadership; the right business model, processes and systems; and the right collective (cultural) capabilities - e.g. strategic anticipation, speed, customer-focus, flexibility, team working, cross-boundary working, generating new learning and innovation, etc. From the literature review it appears that the performance of law firms is closely associated with their ability to function effectively in a business environment that relies on IKM processes, systems and methods to share their know-how internally as well as with their clients, and also to keep this knowledge safe from their competitors. To understand the relationship between IKM and the business of a law firm requires insight into the work product of lawyers, and also an appreciation of lawyers as skilled legal researchers. This section briefly describes the work product of lawyers and serves as background information to understand the role of knowledge management in law firms. Note that this section is not intended to give a detailed analysis of the work lawyers perform in practice. The work product created by lawyers includes, for example, legal documents, pleadings, depositions, trial and appellate briefs, memoranda, letters, emails and spreadsheets, et cetera. Each "work product" has the potential to be an important knowledge asset and ought to be properly managed. If managed well, knowledge is leveraged to alleviate further work production and knowledge creation. This is not a new concept to lawyers. However, with the continuous developments in ICTs, IKM plays a significant role in the future success of law firms. 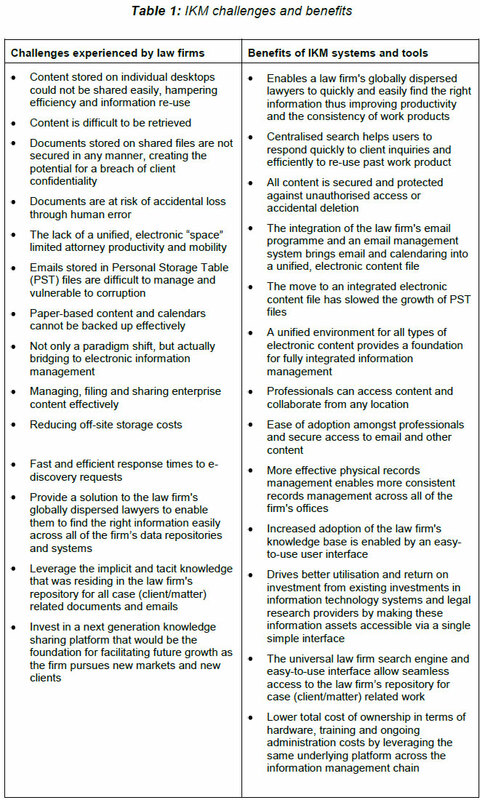 A brief comparison of the information management-related challenges and benefits experienced by international law firms follows, to shed some light on the importance of information and knowledge management in law firms. Many international law firms, such as the law firms mentioned above, have entire knowledge management teams in place and managers designated to law firm information and knowledge management, whilst having an entire KM team is rather new in the South African context.28 In South Africa, if individual lawyers are not in a position to manage information and knowledge efficiently, it is recommended that law firms appoint designated professionals tasked with knowledge management at the law firm. The above comparison and literature review on IKM highlight its importance internationally and in South Africa. The preceding discussion gives an overview of the law firm work product and the prerequisite skills in legal research to create such a product timeously and to the satisfaction of the client, who eventually is billed by the hour. In the context of knowledge management and what it sets out to achieve, this article proposes that the billable hour burden may be converted into a blessing. What this blessing involves is the focus of the empirical survey which sets out to investigate the current situation with regard to IKM in South African law firms. The purpose of this study is to determine how and why law firms, specifically South African law firms, apply IKM technologies to assist and support lawyers in delivering legal services. The study has a qualitative research design and the approach is mainly exploratory and interpretive in nature. An online questionnaire (structured) was used as the data collection instrument. The study is inclusive in the sense that it included all sizes of South African law firms. The data set is derived from South African firms only and dependent on respondent views. The study sample included practising legal professionals, law librarians, law firm support staff, and other legal information service providers. Every effort was taken to ensure that the sample covered a wide area of the Republic of South Africa, which entailed sending emails to all recipients listed on professional associations' member lists such as OSALL and SLIS29 with the request to further distribute the questionnaire to practising lawyers and other law firm staff. In addition direct emails were sent to individuals at law firms which were followed-up telephonically. A total of 132 responses were received, of which some were rejected for reasons such as the respondent's submitting the form without completing the questionnaire. With the exclusion of the responses that were rejected by the online survey system, the survey response rate to the study was 69%. The online questionnaire consisted of 34 questions. The questions were generally constructed with either fixed alternative items, for example the participant had to respond by indicating "Yes" or "Nº "; or applied an ordinal scale in terms of items to characterise their features and performance. Participants were requested to follow a link to the online questionnaire and they were given an eight-week period to respond electronically before the analysis was undertaken. The data from the questionnaires was processed by using the statistical analysis features of the online survey programme. The research results were then put into spreadsheets with statistical graphics for a visual presentation of the findings. 9% of the participants were lawyers, 75% were law librarians, and 16% fell into the 'other' category, those who described their function as KM support staff, IT department staff, office managers and legal information service providers. Of those responding to the survey, 3% of the participants were from small law firms or were solo practitioners (i.e. 1-10 practising lawyers); 25% of the participants were from small to medium-sized law firms (11-50 practising lawyers); 9% were from medium to large-sized law firms (51-100 practising lawyers); 35% were from large law firms (more than 101 practising lawyers); and 28% represented the other segment of the sample. From the above list it seems that systems used for managing a law firm's contacts, BI and CI, learning management systems, cloud computing and ODR systems are not in high use in South African law firms, a situation which raises some concern. Of definite concern is the fact that not a single law firm uses semantic technologies. This may be attributed simply to the participants not being familiar with the questionnaire terminology. Nonetheless, the result remains worrying given the previous discussion of the legal profession which identifies itself with a theoretical body of specialised knowledge, viz ontology.32 As mentioned above, ontology is of particular significance to law firm knowledge management because it is a means of knowledge representation. In the first category, the main reason for having a web presence is because clients or the community require the law firm's web presence. This was indicated by 91% of participants and reflects the need of law firm clients to interact with legal service providers in an online environment. The second important reason noted was because younger lawyers consider it necessary to have a web presence, as indicated by 68% of participants. This finding signifies the entrance of the younger generation to the workplace and reflects their need to interact in an online work environment. In the second category, the two main reasons for having a web presence are to compete in the legal services industry, and to develop the law firm's brand. However, only 19% of the participants indicated that their secure web site reflects their firm's digital lawyering venture. This finding indicates the need for focused attempts in law firms to provide a secure online legal service delivery platform. In the above list the least important reason given for using law firm technologies, which is indicated by only 4% of the participants, is that of participation in CoP discussions. However, in response to the question on what technologies are used to obtain sources of legal information, a significant number of the participants (77%) indicated that they consult others through online user groups, listservs or social networks (see Figure 1, next page). These technologies (online user groups, listservs and social networks), are used by CoP. The problem thus seems to be not a lack of interest in or Nº usage of the technologies associated with CoP, but a lack of awareness of the knowledge management benefits of CoP. This finding is an indication to law firm knowledge managers that a gap exists in their legal practices in terms of CoP. 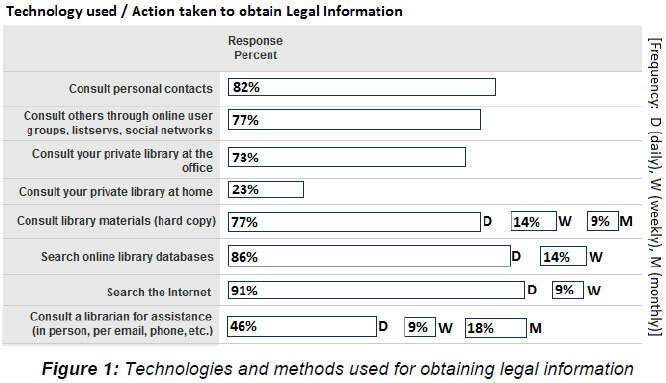 The responses of participants to the question on what technologies are used or what actions are taken to obtain sources of legal information are presented in Figure 1 (below). From these results it seems that searching the internet, not surprisingly, is the primary technology used for finding information. All participants use the internet for information finding; 91% of participants search the internet daily, and 9% of participants search the internet weekly. All participants use online library databases to find legal information; 86% of the participants use these sources daily, and 14% of the participants weekly. All participants use library materials (hard copies); 77% of the participants use it on a daily basis, 14% on a weekly basis, and 9% on a monthly basis. Not all participants consult librarians as part of their information finding strategy. Of the 73% of the participants who do consult librarians for assistance, whether in person, per email or telephonically, to find legal information, 46% of the participants do this on a daily basis, 9% on a weekly basis, and 18% on a monthly basis. Other technologies and activities to obtain legal information include consulting with personal contacts and using private libraries at the office or at home. See Figure 1 (below) for a presentation of the technologies used or the actions taken to obtain legal information. In addition to determining which technologies and methods are used for obtaining legal information, a question was posed to determine what work-related reasons the internet was used for when participants were not at the office. Participants used the internet, when away from the office, mostly for the following reasons: 86% of the participants to communicate with colleagues and clients via email and to gain access to online databases, 57% to retrieve and work on office documents, and 33% of the participants use the internet to gain access to their calendars. Special notice should be taken of participants' positive attitude towards the potential applications of IKM systems (see Table 2, below) and specific consideration and action should be taken with regard to their concerns (see Table 3, next page). In summary, the major perceived advantages of using technologies are improved access to information and increased efficiency of communication with colleagues. Only 44% of the participants consider the internet to be a very effective research tool, 47% consider the internet to be moderately effective, and 9% of the participants perceive the internet to be an effective research tool only to a small extent. The two major concerns of participants are, firstly, that they need a common electronic location where colleagues can obtain the existing work product, and secondly, that a growing amount of their work product is contained in email and email attachments. Taking these findings into account it is suggested that law firm knowledge managers in conjunction with their IT departments determine strategies and implement systems to better manage law firm electronic communication systems and enable access to the vast source of law firm information and knowledge that exists in lawyers', law librarians' and other law firm staff's email repositories. It can be seen in the above table that most participants perceive the application of technology and KM-related activities as useful. Of some concern is the seeming ineffectiveness of the existing systems to ensure continued access to information should their current locations be damaged or destroyed. This concern, together with the findings derived from the following five questions, focuses attention on the increasing need for improved measures with regard to information security and confidentiality, computer viruses resulting in information corruption and content authenticity (Table 3, below). Next, the participants' opinions about the competencies of legal researchers were tested. An arrangement of these skills and competencies in order of significance is given in Table 4 (below). Not surprisingly, the two major skills involve knowing how to find appropriate information and where to find appropriate information. 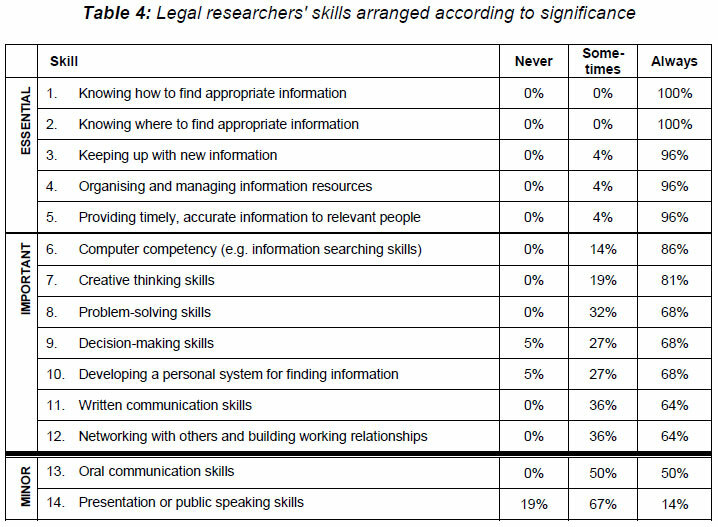 The findings can be divided into three categories, namely, essential legal research skills (90%-100%); important legal research skills (60%-89%); and less important legal research skills (0%-50%). Participants clearly indicated that efficient legal research relies on knowing how and where to find appropriate information. Other essential skills included keeping up to date with new information, organising and managing information resources, and providing timely, accurate information to relevant people. In addition to these skills, participants regarded computer competency and creative thinking as important legal research skills. Other skills, such as problem-solving skills, decision-making skills, developing a personal system for finding information, written communication skills, networking with others and building working relationships are generally regarded as important, although they are not always required. Skills that are not necessarily required in legal research include oral communication skills and presentation or public speaking skills. In the latter instance, some participants noted that whether or not they were required depended on the context of the required outcome. In summary, and specifically keeping the billable hour in mind, the findings of this study may prove useful in understanding how KM can make the difference between billable and non-billable hours. For example, if a young graduate who recently joined a law firm's graduate programme has to draft a document from scratch, the hours it takes to draft the document cannot be billed. If, however, a young associate attorney has access to the law firm's knowledge repositories, spends the same number of hours learning from existing know-how and using it to its fullest extent, the attorney's work output will increase, not only in terms of drafting a single document, but in terms of producing several work products that can actually be billed to a client. Lawyers are rewarded for how effective they are in applying their knowledge, and their efficiency is measured in the legal accuracy of the work product that they deliver to the client. Delivering an accurate work product relies on having accurate legal information and knowledge. In order to deliver accurate legal services, law firms can apply a variety of tools and technologies to streamline the processes of legal work and reduce costs. For several years the significance of ICTs has been growing in the legal practice domain, and in the knowledge economy now emerging in South Africa, the efficiency of South African law firms depends on how they apply ICTs to their advantage. Gaining advantage in legal practice requires effective legal information and knowledge management. The objective of information management is to improve the accessibility, retrieval and storage of information; and the objective of knowledge management is to facilitate knowledge sharing between people to their own advantage and to their company's advantage. The findings of this study show that South African law firms utilise some of the key technology infrastructures such as intranets, document management systems and electronic communication systems. However, more sophisticated systems such as automated document assembly and online dispute resolution are not yet fully implemented. Semantic technologies are not applied and cloud computing does not feature in South African law firms, a fact which suggests that further research is required into its value to law firms. The potential value of implementing KM and applying IM technologies lies not only in satisfying clients' growing need for a trusted online platform to interact with legal service providers, but for law firms to capitalise on their intellectual assets, to improve legal practice management, to empower lawyers, to increase productivity, to use time more efficiently, to facilitate the transfer of skills and knowledge from senior to junior legal professionals, to improve legal service delivery and to gain competitive advantage. In conclusion, South African law firms apply many technologies that are essential to providing a trusted online platform for legal service delivery. The key to gaining further value from the law firm's intellectual assets is to manage the law firm's information and knowledge. If individual lawyers are not in a position to manage information and knowledge efficiently, it is recommended that law firms appoint designated professionals tasked with knowledge management at the law firm. 1 Susskind End of Lawyers; Vorakupipat and Rezgui 2008 Knowledge Engineering Review 291; Jarvenpaa and Tanriverdi 2003 Organizational Dynamics 403. 2 Winterton and Danner (eds) 2011 Legal Information Management. 3 Rusanow 2007 Information Outlook 31-34; Van Rensburg and Prideaux 2006 Journal of Management Development 561. 4 The survey was conducted in 2010. 5 Maister 2006 davidmaister.com. Cf Rusanow 2006 www.llrx.com; Du Plessis 2004 Information and knowledge management 77-78, and Martin 2002 Leveraging intellectual capital. 6 Rusanow 2007 Information Outlook 34. 7 Susskind End of Lawyers. 8 Sieh "Law 2.0"; Susskind End of Lawyers; Winterton and Danner (eds) 2011 Legal Information Management. 9 Brinkley Defining the Knowledge Economy. 10 It may be argued that KE is non-existent or barely in its infancy in South Africa. This article expresses the opinion, based on empirical research findings, that in fact the KE is emerging as seen in South African law firms' application of KM technologies, tools and techniques to support lawyers as knowledge workers in day-to-day legal practice. For instance, the findings of the current research are that South African law firms may be comparable with global law firms in terms of competitiveness, cf Segal-Horn 2007 IJSIM 206-217. 11 Du Plessis 2005 SAJIM; Winterton and Danner (eds) 2011 Legal Information Management. 12 Hemming 2008 LIM 43-46. 13 Vorakupipat and Rezgui 2008 Knowledge Engineering Review 291. 15 Holbeche 2009 LIM 253. 16 Muir and Douglas 2001 Managing Service Quality 177-178. Katsh 1994 University of Pittsburgh Law Review. 17 Katsh 1994 University of Pittsburgh Law Review 1141-1175. 18 Cross and Bathija 2010 Artificial Intelligence for Engineering Design, Analysis and Manufacturing 127. 19 OWLs form part of current semantic technologies and include ontology, taxonomies, folksonomies and clustering intended to provide context to content by formally describing concepts, terms, and relationships within a given knowledge domain. Cf Du Plessis 2004 Information and knowledge management 109-110 and Du Plessis "Global legal practice". 20 Cf Du Plessis 2011 SAJIM. 21 Beaumont 2010 Business Information Review 232. 26 This input was received by one of the peer reviewers elaborating on the current importance of information and knowledge management in North American law firms. 28 This does not mean that knowledge management is not a function at South African law firms. 29 Organisation for South African Law Librarians (OSALL); Special Libraries Information Services (SLIS). 30 Eg, systems with embedded compliance requirements. 31 Eg, IaaS, PaaS or SaaS - infrastructure, platform or software as a service, i.e. the ability to rent server space, software programs and IT maintenance. 32 See n 19 above.